Who owns an airliner, do not performs random flights, the company has a schedule of dates and times where each plane carries its flights in an organized and pre-defined way. The Flight Control was designed precisely in order to organize and pre-set flights to the commanders who use Flight Simulator as well as the virtual airlines. With a simple and intuitive interface, the Flight Control allows the user to create, define and change dates, flight times and users. 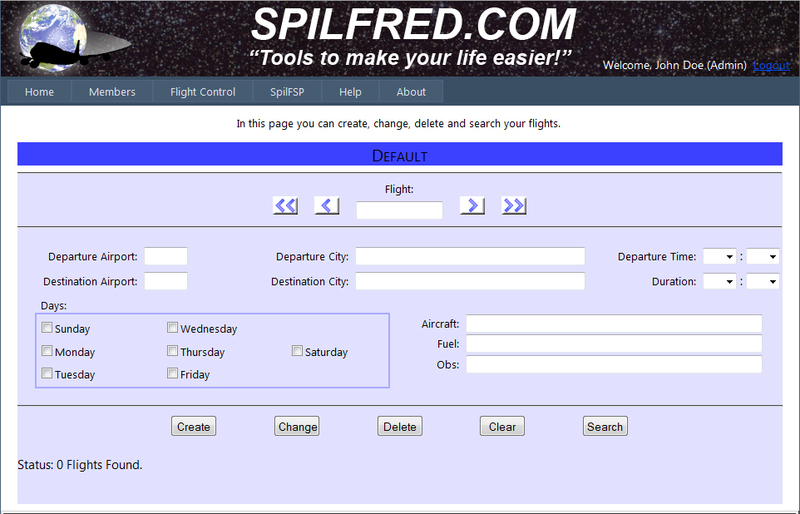 We will explain, step by step, how to enjoy all the features of the Flight Control from Spilfred.com. 1. Access the http://www.spilfred.com page. 2. In main page click on “Create User” menu. 3. Type the user name in the field “User Name”. 4. Type the a password in the “Password” field and type it again in the “Confirm Password” field. 5. Type the user e-mail address in the “E-mail” field. The e-mail will be useful in case of a forgotten password. 6. Type the security question in the “Security Question” field. The question whose answer should be something that is easy to remember. i.e: Favorite movie. 7. Enter the secret answer in the "Security Answer". In case of forgotten password, the system before sending the new password for the user's e-mail will ask the security question and the user must enter the answer. If the response matches what was entered when creating the user, a temporary password will be sent to the registered e-mail. 8. Click on “Create User”. 9. Click "Continue" and if the name of the user you created appears in the upper right of the page, the user is already connected to the Flight Control System. 10. While the user is connected to the system, the options menu will show the "Flight Control" and "Members" options. 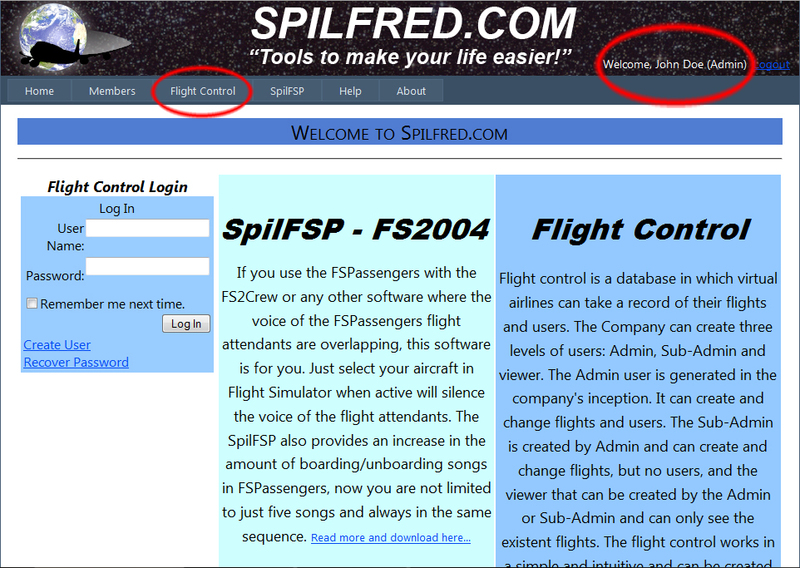 Click "Flight Control" to access the main page of the system. - The blue band with the text "Default": It appears where the name of your virtual company (will show how to change later). - The “Flight” field: Shows the Flight number. - The navigation buttons: “<<”: Shows the first flight, “<”: Shows the previous flight, “>”: Shows the next flight and “>>”: Shows the last flight. - The “Departure Airport” field: Displays the ICAO code of the departure airport. - The “Departure City” field: Displays the city's and the country of the departure airport. - The “Departure Time” fields: Displays the hours and minutes of the scheduled departure. - The “Destination Airport” field: Displays the ICAO code of the destination airport. - The “Destination City” field: Displays the city's and the country of the destination airport. - The “Duration” fields: Displays the hour and minute of the expected duration of the flight. - The “Days” checkboxs: Display the days when the flight occurs. - The “Aircraft”field: Displays data related to the aircraft used for flight. - The “Fuel” field: Displays data related to the amount and use of fuel. - The “Obs” field: Displays additional information and comments about the flight. - The “Create” button: When pressed creates the flight on database of the company. - The “Change” button: When pressed save changes made in the flight. - The “Delete” button: Delete the Flight from database. - The “Clear” button: Clear all fields in page. - The “Search” button: Search flights that meet the selected criterias. - The "Status" text: Displays information on the establishment and number of flights. 12. To create a flight, first enter its code in the "Flight" field (i.e. S0143). 13. 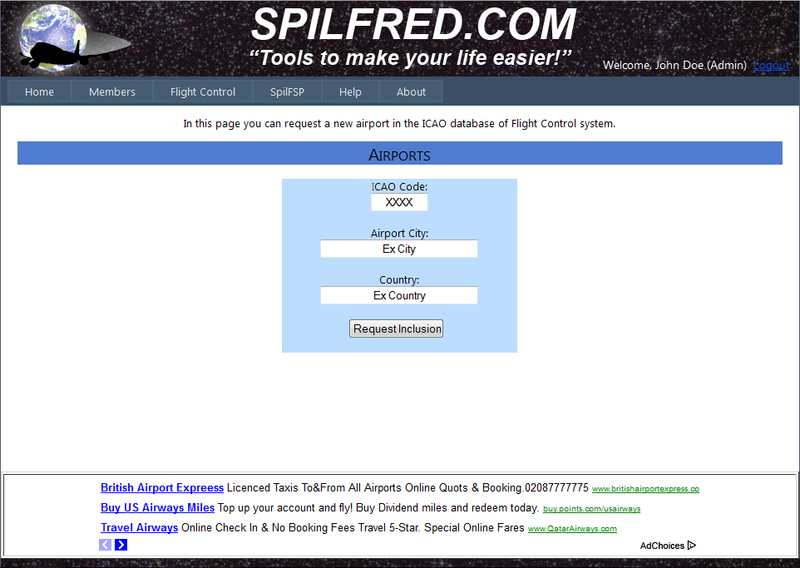 Type in the "Departure Airport" field the ICAO airport code (i.e. SBGR). 14. Note that once you click off the field "Departure Airport" will automatically appear the name of the city and the country in the "Departure City" field. 15. Enter the hours and minutes for the departure in the "Departure Time" (i.e. 10 : 45). 16. Similarly fill the "Destination Airport" (i.e. Klax) and "Duration" (i.e. 13 : 50). 17. Click on the days that the flight will occur (i.e. Sunday, Wednesday e Friday). 18. Type in the "Aircraft" field the data relating to aircraft (i.e. Boeing 747-400...). 19. Type in the "Fuel" field the data relating to fuel (i.e. 35.000 Kgs...). 20. Type in the "Obs" comments you want about the flight (i.e. A87223...). 21. Now just click in the “Create” button. Your flight was created. 22. Do the same to create as many flights as you want. 23. 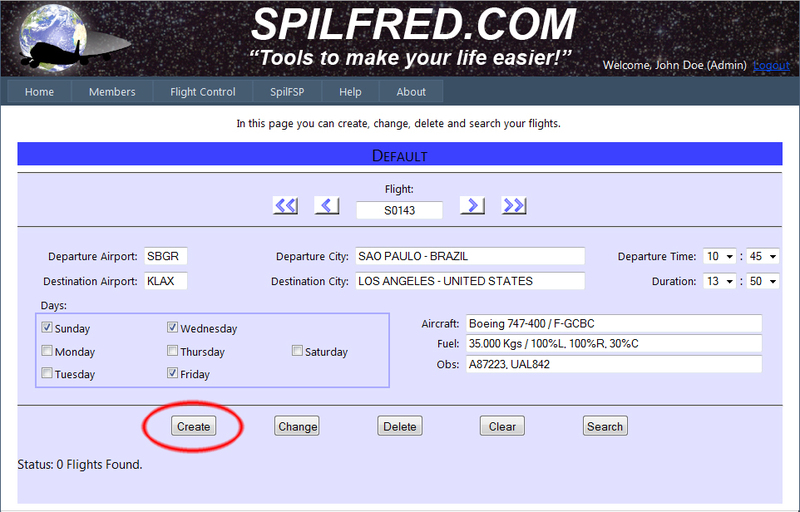 If you need to change any data of a flight already created, simply change the desired field and click the "Change" button. 24. The "Delete" button when pressed, erease the flight on display. 25. To clear all fields, click the "Clear" button. 26. To search for a flight, put the data to the form and click "Search". 27. To list all the company's flights, place your mouse over the menu "Flight Control" and when the list appears click on "Flights List". 28. Will be listed in summary form, all the company's flights. 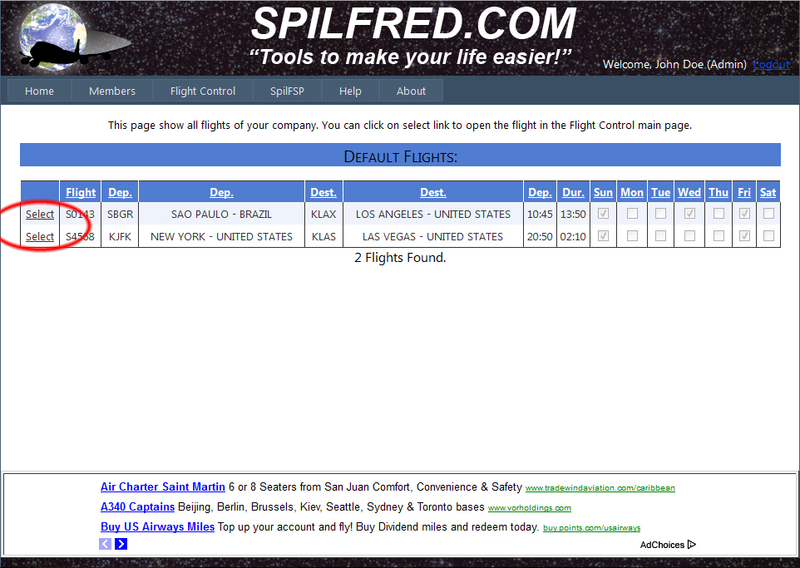 Click on the word "Select" to display the flight on the main page of Flight Control. 29. Are registered in the Flight Control more than 24,400 airports. If in the creation of a flight, the ICAO code entered does not appear in the database, the user may request the inclusion of the code. 30. To request the inclusion of the ICAO code, place your mouse over the menu "Flight Control" and when the list appears click on the "Airports". 31. In the "ICAO Code" field type the ICAO code, in the "Airport City" field type the city from the airport and in the "Country" field type the country. 32. By clicking the "Request Inclusion" button the code will be sent to the site administrator for conference, but will be already available in the database. 33. If the administration of the Flight Control can not prove the existence of the airport, both the code and flights related to it will be deleted without notice to the user. 34. To change the company name put the mouse over the menu "Flight Control" and when the list appears click the "Change Company Name". 35. The "Company Name" displays the current name of the company. 36. 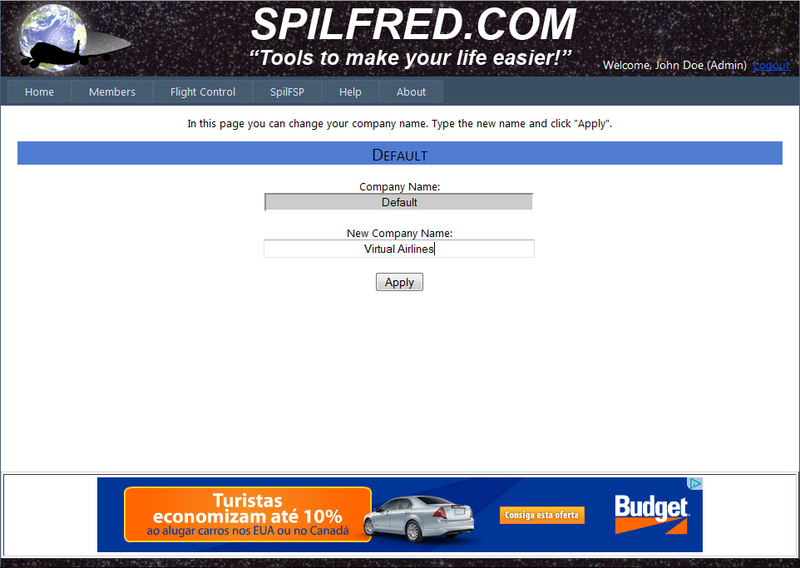 Type in the "New Company Name" field the new company name and click the "Apply" button. 37. The Flight Control has three user levels: The "Admin" which is who created and manages the account, the "Sub-Admin" that can create, modify and delete flights and the "Viewer" that can only see the flights registered. 38. 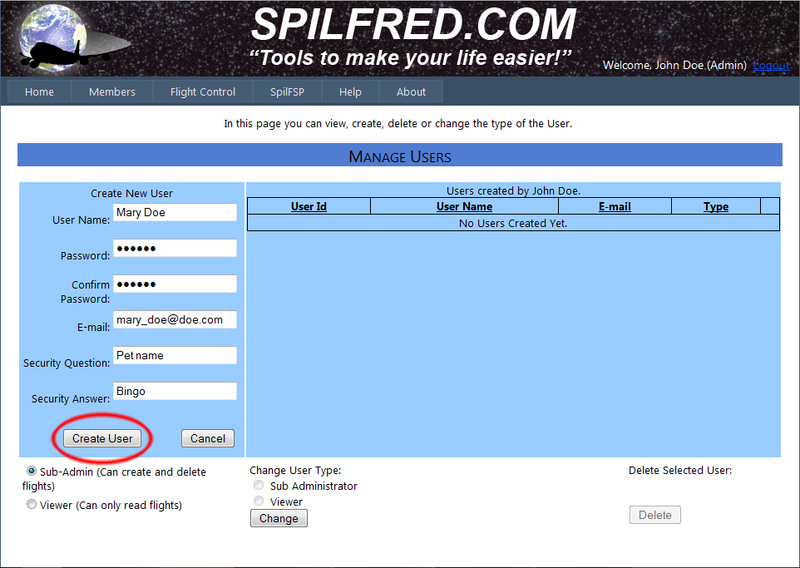 The "Admin" user can create, modify and delete users through the page "Manage Users", which is in the "Flight Control" menu. - On the left is a box for the creation of new user. - On the right are listed all users regarding the account, except the user "Admin". - Below the box to create new user there are two radio buttons "Sub-Admin" and "Viewer". - Below the user list on the left are two radio buttons: "Sub-Administrator" and "Viewer", and "Change" button. - Below the list of users to the right there is the "Delete" button. 40. To create a new user please fill in the box to create new users. 41. Click the type of user that will be created: (i.e. Sub-Admin) then click on “Create User” button. 42. Will appear the confirm the creation of new user. Click the "Continue". 43. The user just created now appears in the list on the right side of the page. 44. To change the type of user click on the word "select" on the right of each existing user. 45. Select at the bottom of the type of user who is assigned to the selected user and click the "Change" button. 46. To delete the user click on the word "Select" and click the "Delete" button. 47. In the Flight Control users can change their own email and password. 48. To change your email or password put the mouse over the menu "Members" and click the "Change Password / Email". 49. 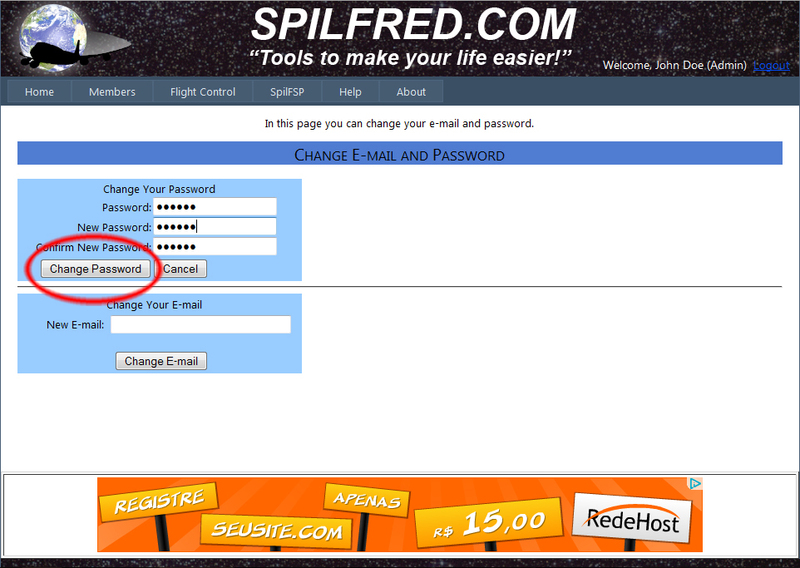 Type in the "Password" field the current password, type the new password into the "New Password" field, then in "Confirm New Password" field and click the "Change Password" button. 50. After confirming click the "Continue" button. 51. To change the email, type the new address in the "New Mail" field and click the "Change Email" button. 52. A text will be displayed stating that the email was changed. 53. To delete an account with all flights and users, put the mouse over the menu "Members" menu and when the list appears click "Delete Account". 54. Type the name of the Admin user in the "Admin User Name" field and click the "Delete" button (All users and flights created by this account will be deleted as well). For questions, comments and suggestions please send email to: support@spilfred.com. I will try to answer as soon as possible. I hope that this software is useful to virtual commanders as it was for me. Good fun and good flights.